Trends always change with time, and web design is no exemption. New styles and techniques come in and dominate the design scene. Even the navigation menu’s top position is challenged with other ideas such as vertical menus. Navigation menu serves as the tour guide to your website. It helps visitors explore parts of the website conveniently. 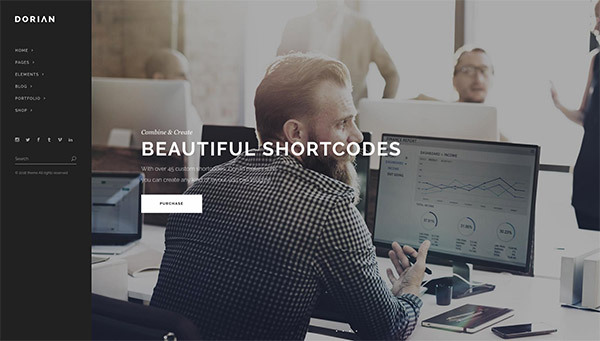 For those who want to have a refreshing and a bit unorthodox web design, then these themes with fantastic vertical menus may give you what you want. This list accommodates various styles and techniques such as collapsible menus, hover animations, and fixed designs. Check them all out below and own the best at a reasonable price. Without further ado, enjoy your browse! 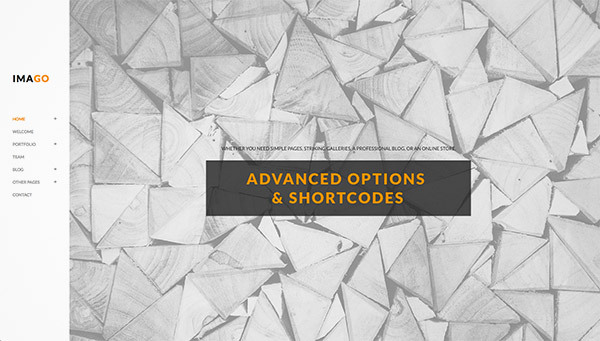 Nikka is an AJAX portfolio theme that has a vertical menu on the left part. Its design includes a collapsible menu upon hover that makes navigation easier. It has a clean web design with beautiful effects that can enhance your website. 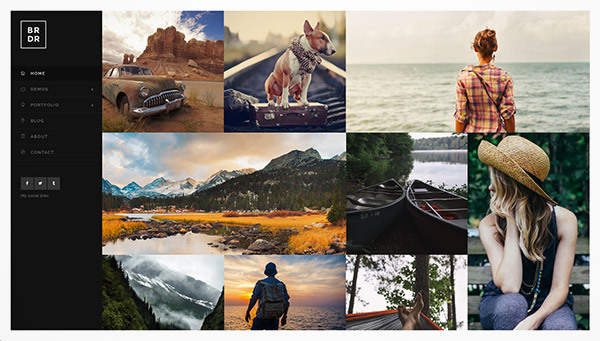 This grid motif portfolio website is great for photographers and other creatives who want to showcase their work. It has a dark-themed vertical menu with social icons at the bottom. 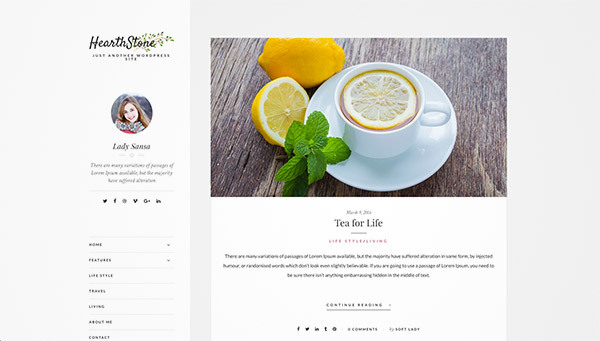 Kappe is a WordPress theme that has a grid design and a vertical menu. 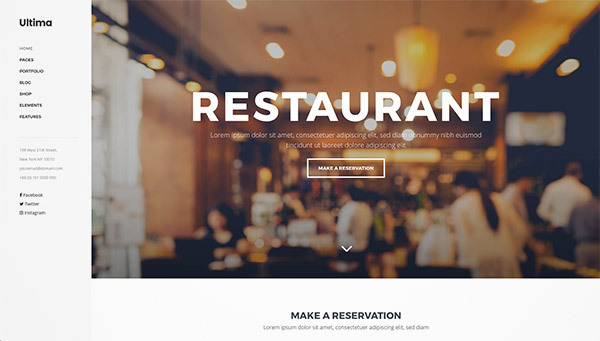 The menu has gradient effect with hover animation for added flare. It has a powerful admin panel, unlimited sliders & sidebars, unlimited colors, PO & MO files for translation, 300 icons, 500 fonts, 5 custom widgets, and more. 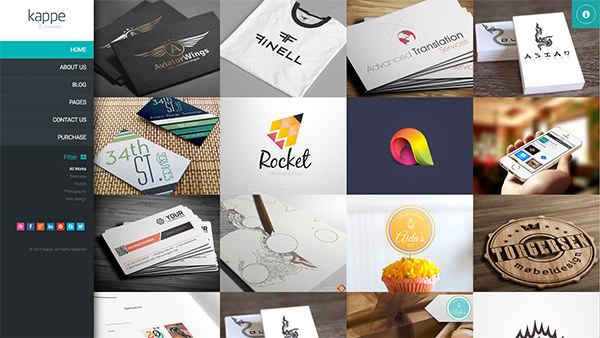 Crimson is a powerful theme for agencies and freelancers. 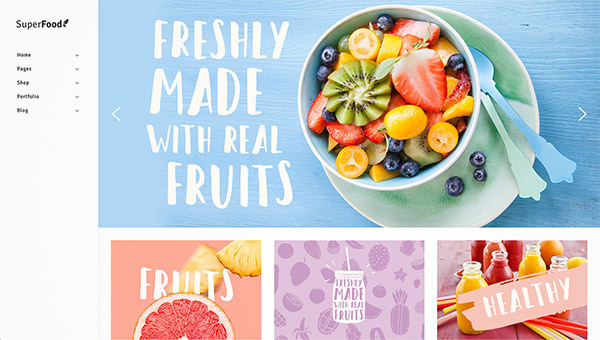 One of its homepage designs has a vertical menu with pink background fill while its content is displayed in a clean grid layout. 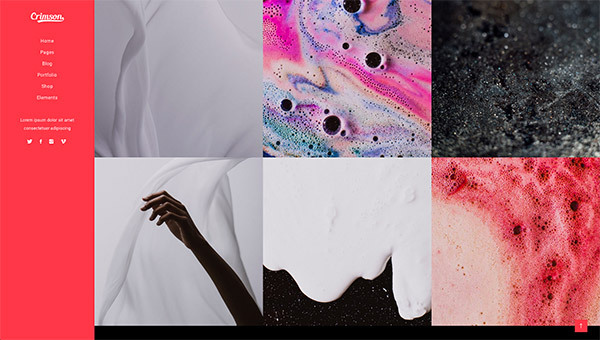 Lumos is a multipurpose theme with single & multi-page designs featuring horizontal/vertical header, dark/light style options, and unlimited color presets. Its clean and professional design will be a great solution for your portfolio, business, personal blog or any other purpose website. 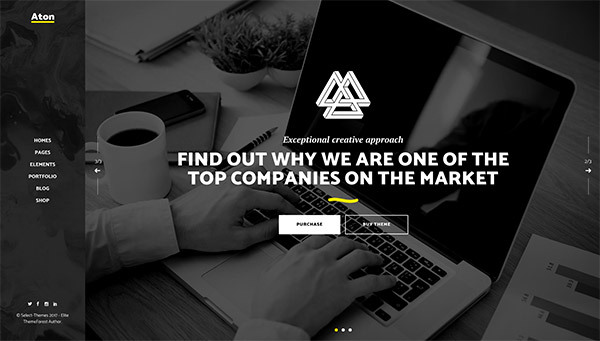 Montblanc is a clean, creative & professional WordPress theme with great features including retina ready display, responsive layout, Visual Composer, Contact Form 7, 600+ fonts, Font Awesome icons, and more. 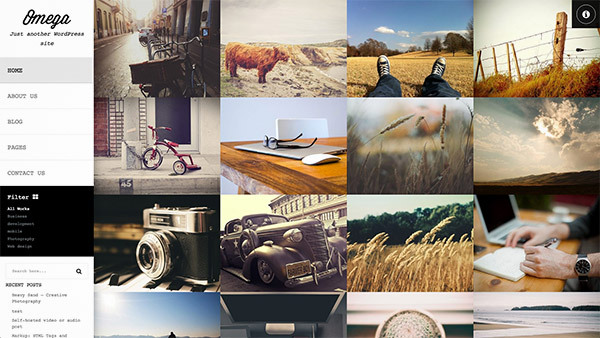 It is easy to customize and can be used for freelancers, photographer, creative agencies, or personal. 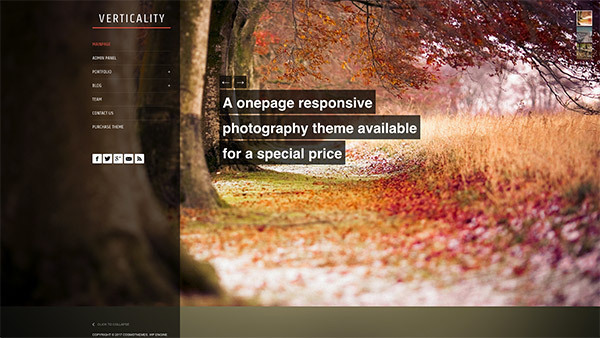 RT-Theme 15 is a premium responsive WordPress theme with powerful CMS tools. 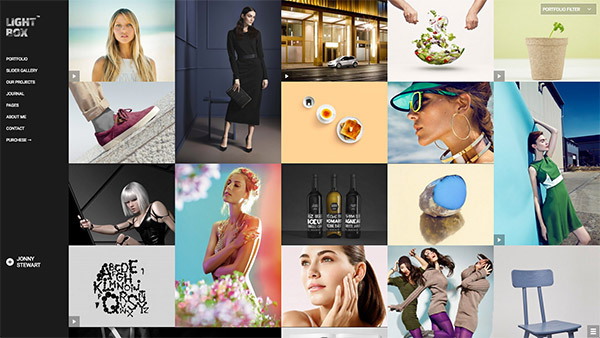 You can use it for business, corporate, product catalogue, services or portfolio web sites. The product and portfolio tools also give you wide opportunities to use in various services as tour itineraries, rent a car, real estate or hotel room presentations. Lion theme comes with 7 different skins to choose from. One of them has a vertical navigation with clean grid layout design. It has Slider Revolution, various header designs, WooCommerce compatibility, and more. Minnesota has a big compilation of homepage designs. It comes with a long list of great features such as a powerful admin panel, one-click installation, retina display, Elated Slider with fullscreen and parallax functions, social widgets, custom shortcodes, many blog layouts, portfolio layouts, and Contact Form 7, to say a few. 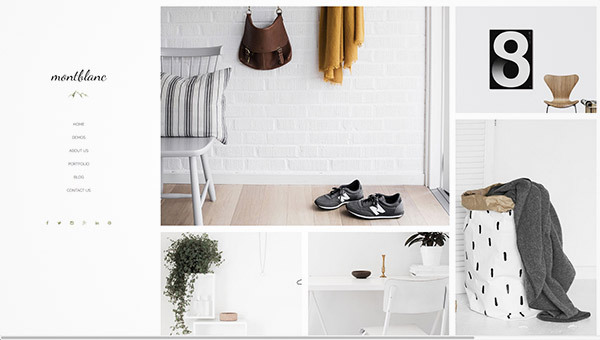 Malmo is a clean and minimalist WordPress theme with a lot of homepage designs to choose from. Its vertical menu theme has a collapsible design through one click. It also comes with custom widgets, shortcodes, blog & portfolio layouts, customizable mega menu, icon font packs, etc. Target is very customizable with no requirements for any coding knowledge. It has a big set of custom pages, layouts, and shortcodes, various preloading effects, header styles, separate logo versions for dark and light themes, Visual Composer, video background sections, parallax sections, and social widgets. Cobra is a responsive theme with features including WooCommerce compatibility, various layout designs, image pattern overlay for page sections, AJAX portfolio/blog, drag&drop builder, bootstrap framework, 1200+ icons, 600+ fonts, and Contact form 7 compatibility. 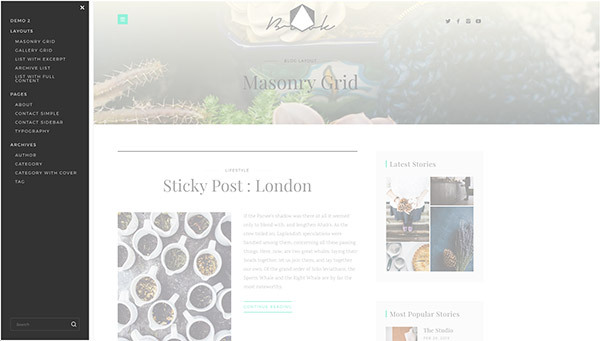 Wild Book is a vintage and creative WordPress theme that is a great choice for personal blog or portfolio websites. 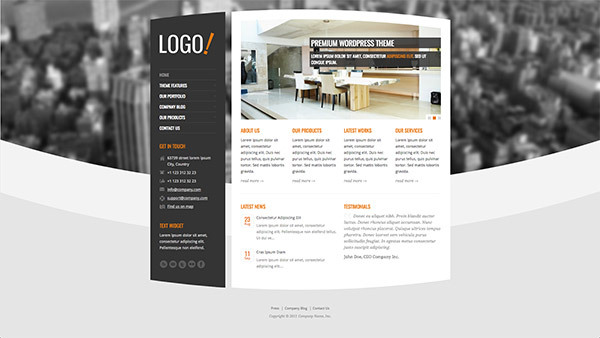 Its design is based on a split page layout with a vertical menu and customizable background. 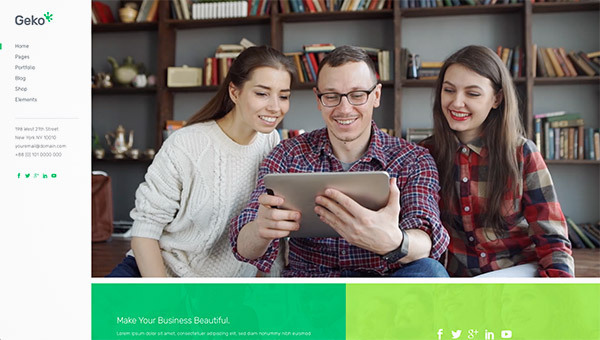 Wild Book is very flexible & customizable, SEO friendly, responsive & retina ready. Omega has a grid layout design and a vertical menu. 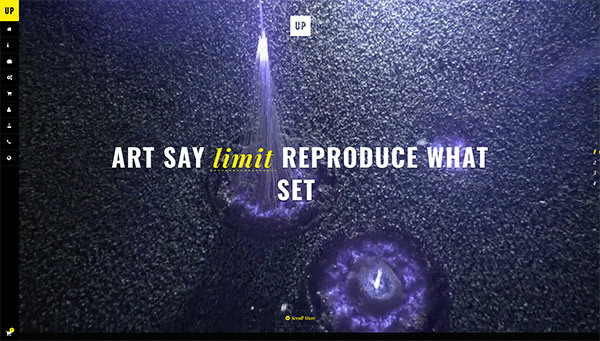 It unusually uses a serif font and has a hover animation. It has powerful admin panel, AJAX-powered post pagination, unlimited sliders, colors, and sidebars, 300 icons, 500 fonts, and 5 custom widgets. 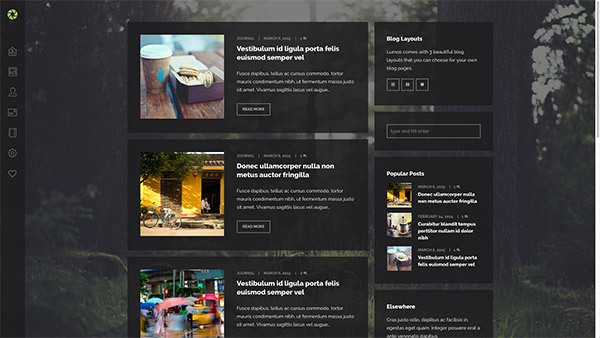 Imago is a clean WordPress theme with retina ready display, Google fonts, Contact Form 7, advanced blog and portfolio layout, WooCommerce compatibility, Visual Composer, Slider Revolution, WPML, and 24.7 support. It is great for various purposes with its versatile design. Vertikal theme stands true to its name with its unique and stylish vertical menu/navigation. It comes with 11 pre-made skins that you can use for your website. It also has premium support should you have any problems in using this theme. Stellar comes with 2 pre-made skins that are sure to put your work on the spotlight. 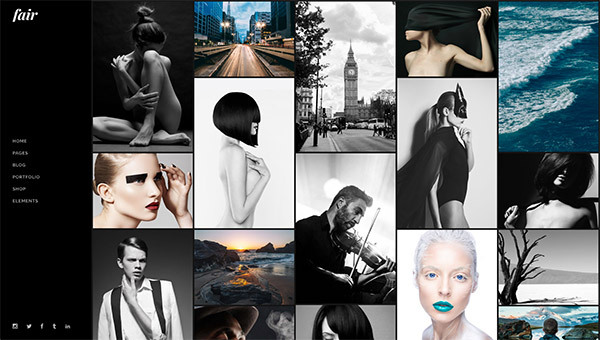 It has unique gallery archives, unobstructed fullscreen slideshow, portfolio also supports HTML, shortcodes & videos, advanced theme panel, etc. Superfood is for websites that offer organic foods and other organic health products. It is easy to use and customize through its powerful admin panel, no coding skills needed. It also has a one-click installation, responsive layout, retina display, custom widgets and shortcodes, blog layout designs, and more in the list. 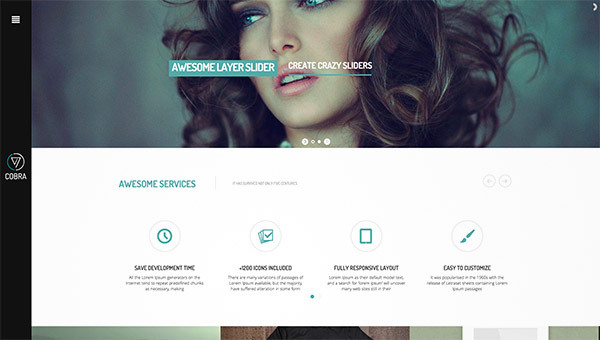 ScrolleUP has a modern and fully responsive layout with parallax effect. It also includes video sections, 2 homepage features (slider and video background), 4 menu types (vertical menu with/without icon, horizontal dark menu, & horizontal light menu), 11 loading types, 30+ shortcodes, filter option for portfolio, Font Awesome icons, and more. Ultima has a modern admin interface that will allow you to easily use and tweak the theme to your own liking. It has a one-click import feature and is backed with other great features such as pre-made page layouts, custom shortcodes, smooth transition animations, 15 preloading effects, 4 header types, 3 logo versions, customizable mega menu, etc. HearthStone has a classic, clean, and modern aesthetic that every reader will love. It has a responsive layout for any devices and is retina display ready. 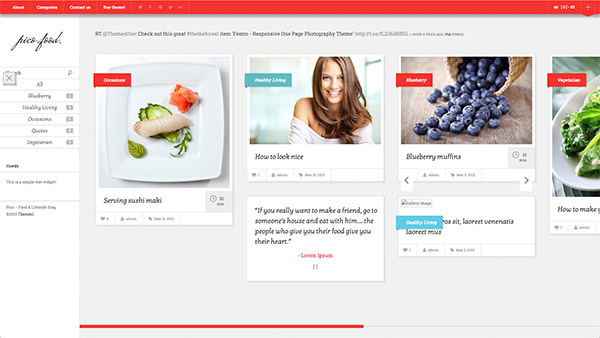 It supports 9 post formats including standard, category, video, link, images, audio, quote, gallery, and sidebar. It also works in all popular browser and is optimized to load faster. 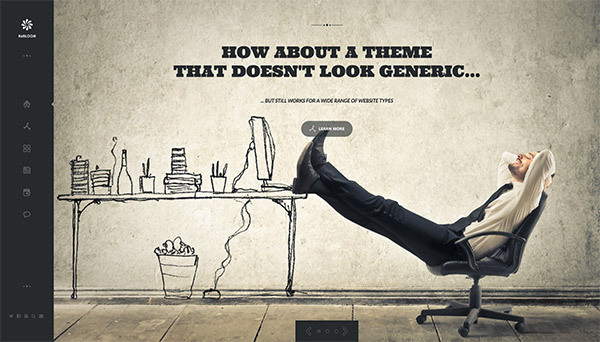 Pico is a clean and elegant WordPress Theme that is designed to ensure that the focus is in your content. It is perfect for food/health/lifestyle blog sites, but is also great for anyone who wants to have a beautiful blog site. 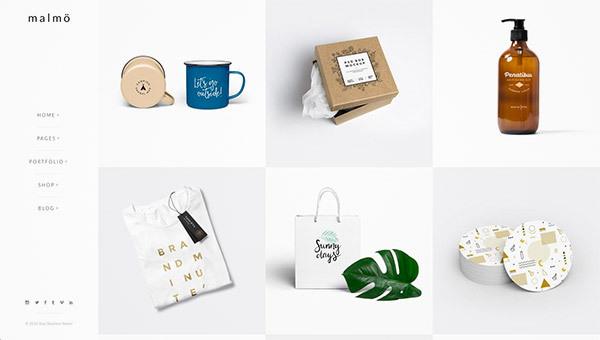 Blu has an elegant design that is backed with awesome features including various elements, Revolution Slider, Visual Composer, 4 font icon packs, WooCommerce compatibility, premium support, and great documentation. 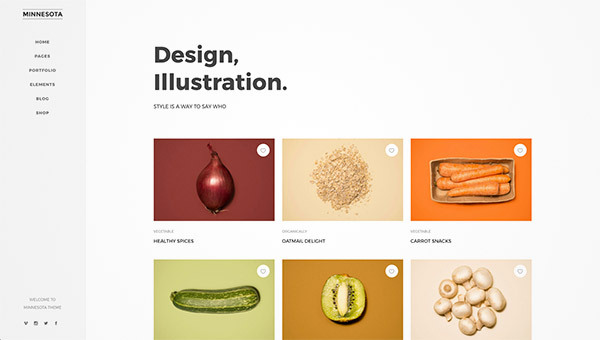 Geko has 12 homepage designs and one of them has a beautiful vertical menu that has a minimal yet elegant design. It has Visual Composer and Revolution Slider added, unlimited colors, fully responsive layout, translation ready, documentation and premium support. 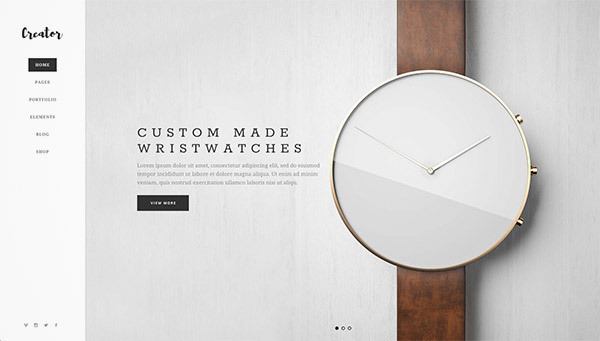 Creator has an elegant and minimal design that is great in showcasing works and products. 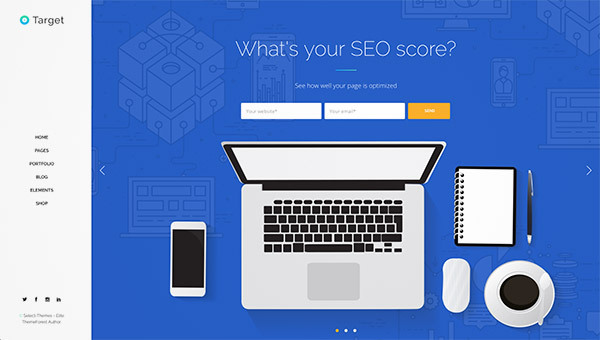 The theme has tons of widgets and shortcodes to enhance your site. It also has a big set of premade page layouts, typography options, Elated Slider, blog layouts, 9 header types, and other great features. 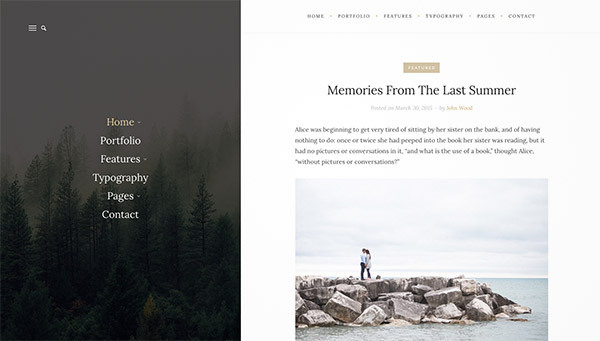 Brook is a light, spacious, and versatile blog theme that is carefully crafted to elevate your content in a remarkable and minimalistic style. It comes with an astonishing full-width slider, a smooth AJAX navigation, a variety of post & layout options and sticky sidebar hotspot with custom widgets, Brook ensures an effortless personalization while displaying your blog in a striking and clean manner. Aton has Visual Composer and Slider Revolution for better website management. This theme also has an intuitive admin that helps you customize with less effort. It is well documented and has good SEO practices as well as impressive customer support for your questions. 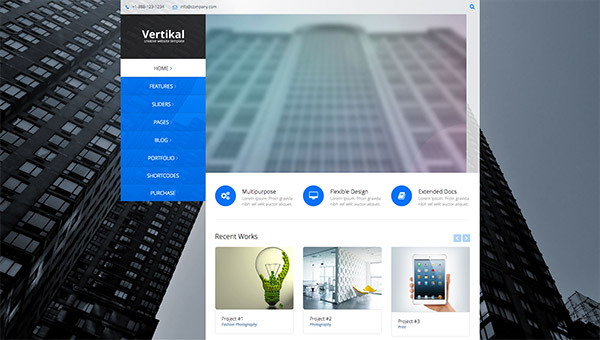 Verticality is a responsive photography theme that is aimed to deliver a power complex portfolio and image-related sites or blogs. This theme uses a framework that permits the site to be accessed on all mobile devices, including iPad and Android powered tablets. Rebloom has a modern layout design with a vertical menu that uses icons. It is retina display ready, easy to customize through theme panel, includes Google fonts, layout variations, Visual Composer and Slider Revolution included, translation and WPML ready, and more features. 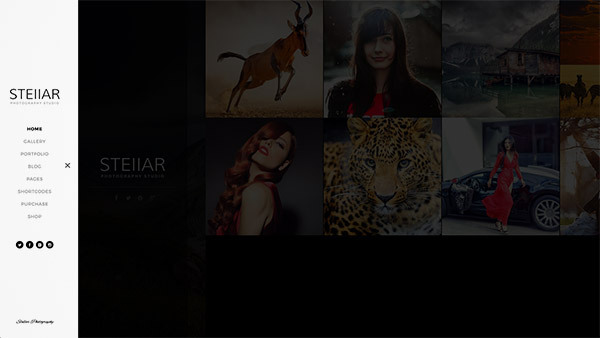 Moose has beautiful vertical menu design with the use of a blurred image background. It comes with Visual Composer, WooCommerce integration, LayerSlider, smooth CSS3 animations, one-click import, custom scrolling animations, and more. 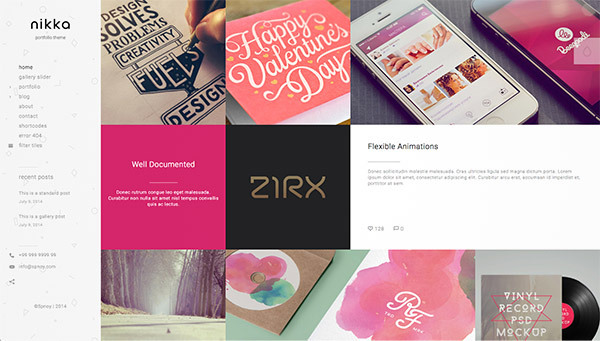 Dorian comes with 5 beautiful blog layouts and styles. It also includes premade inner pages, 7 icon packs, 600+ Google Fonts, WooCommerce compatibility, Visual Composer, Slider Revolution, 3 header layouts with 4 behavior types, social media integration, well documented, 45 custom shortcodes, and access to a support team. Fair has a powerful admin interface and a one-click import for easy use of the theme. 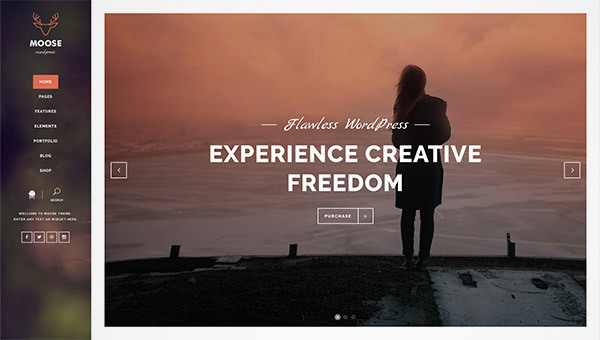 It has a set of beautiful inner page templates, custom shortcodes, header styles, fullscreen menu functionality, portfolio and blog layout designs, image and video lightbox, custom widgets, child theme, etc. 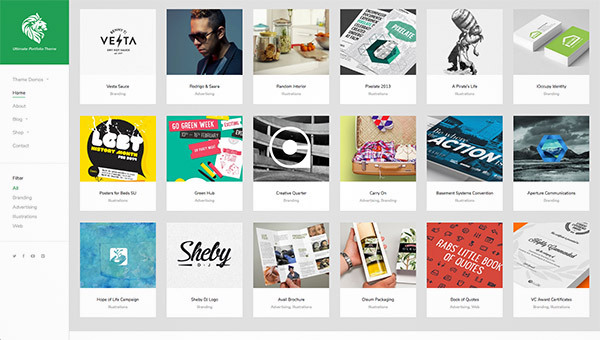 Lightbox has 3 portfolio templates (portrait, boxed, multi-grid), 6 thumbnail sizes, 3 hover effects, dark and light header styles, translation ready, 28 animated social icons, user-friendly theme options, Contact Form 7, and helpful technical support.